We offer a bespoke coach fitting service, for both full and partial conversions of vehicles, to meet customers specifications. Possibilities are vast, from mini kitchens (refrigerator, boiler, microwave) to full kitchens with an extensive range of appliances (industrial microwave, aircraft oven, pull out refrigerators, ice makers, filter coffee machines, hot & cold water). All our work is carried out to a high professional standard in laminate or solid surface. Other interior enhancements include tables, Powered tables to provide phsyio beds, and lounge options. Behind the scenes, we install power systems (inverters, additional batteries) to ensure continued supply. Our coach conversions can also include a fully customised entertainment service. Operators are impressed with the efficiency and reliability of the AD Coach Systems inline hot water system which is installed on many types of vehicles. Scania range of coaches, Irizar, M.A.N, Omni Express,Volvo, Temsa and Mercedes Tourismo are just a few examples. We are also able to design and manufacture small dispensing units, for preferred locations. AD Coach Systems are UK agents and suppliers of in coach catering equipment manufactured by Frenzel GmbH. In conjunction with Frenzel, we are able to supply catering solutions covering the whole spectrum of customer requirements. From fridges and ovens to board kitchens. What ever your make or size of vehicle, we can design and manufacture a servery to suit all requirements. We are able to provide high quality onboard entertainment for in coach using the latest technology in TFT screens. Available sizes range from 7″, generally for on table mounting, up to 22″, mounted in partitions or rack supported. We also can provide roof mounted powered screens in 15.4″ from Actia. 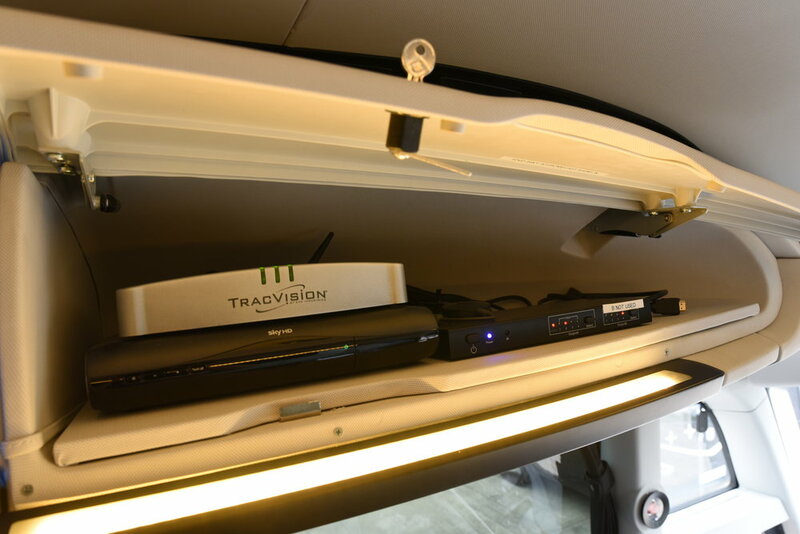 Satellite TV can be fitted to vehicle roofs, we use KVH Tracvision units in conjunction with a Sky or Freesat satellite tuner. We can supply or fit in coach audio from Actia or Bosch. Separate audio/video can also be fitted to run in a rear lounge for example. Wi-Fi and individual headphones, we are able to design systems to meet customers requirements. Our coach conversion service can provide many options for seating solutions. For vehicles with three point belts, options include, Solid surface tables, laminate tables. Bespoke sized table tops can be produced, and we can offer legs sized to fit most coaches. Remote operated legs that can be height adjusted can also be fitted, in cases where physio use is needed. For vehicles that are fitted with lap belts, we can offer certified impact tested tables that are T.U.V approved.